Can you guys who the last one is? Yes LE was actually Elle from Jiggy Fellaz before she became a part of EXID and changed her name to LE. 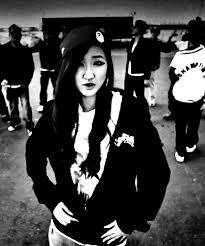 So I've been a huge fan of LE ever since she did the video with Feeldog and JunHyung. LE was also on Show Me the Money 2 ... I actually didn't watch that season and I feel like such a bad fan :( I should probably go back and watch it it's one more my favorite shows ever. I think a lot of people are surprised when you tell them that she was actually an underground female rapper before she got into EXID. Honestly I wouldn't even know who EXID was without LE and she's defiantly my favorite of the group :D.